Nitro coffee. Smooth, easy to serve, and in-demand by consumers, it’s definitely a big deal in the coffee world! We’ve been at the forefront of the nitro coffee movement and provide (in our humble opinion) the best-tasting nitro coffee out there. With several nitro coffees (and teas) available, we’ll help you design a nitro program that fits your needs and your customers demands. 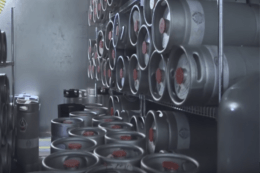 Nitro coffee kegs are compatible with many nitrogen keg coolers. If you’re new to the nitro game, our team will help you select the right equipment, and our service team will get you up and running in no time! Want to take some of our amazing nitro coffee home? See below for a list of growler purchase and refill stations!